Cork Millner, my writing mentor, whom many of you know I adored, passed away recently. I say “my” writing mentor because I felt a close connection to him, but clearly he was not just mine. His memorial service earlier this week was a testament to that. Dozens of friends, family members, colleagues and former writing students all came to pay tribute to him. Cork touched each of us in different ways, but it was clear we all shared one thing in common: gratitude for having had him in our lives. The day of Cork’s memorial service couldn’t have been more spectacular. 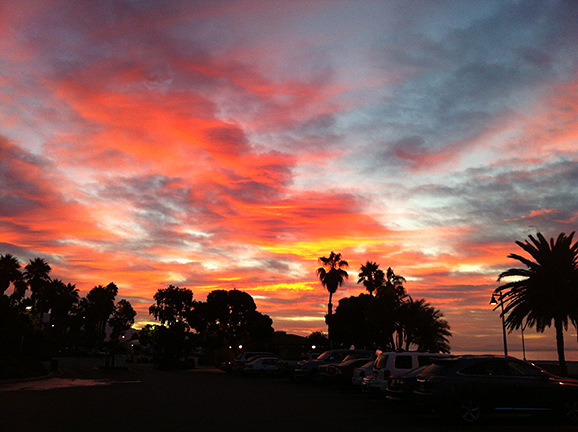 The sun arose with aplomb, casting a blaze of color across Santa Barbara’s morning sky, perfectly symbolizing the richness Cork added to our lives with his charm and colorful personality. As we gathered for his service inside the cemetery’s intimate chapel, we were wrapped in Celtic harp music, then reminded by Reverend Miriam Lindbeck, Cork’s lovely, long-time friend and former writing student, of all the things we loved about Cork. He was “old school stoic,” strong and private, yet sensitive and open. He loved fine wine, fine cars and fine writing. He was charming and dapper, and appreciative of humor–especially his own, which was wry and occasionally acerbic. He was confident, hard-working and fiercely proud of his family and his military service, which included 850 aircraft carrier landings. And then, of course, there was his name. Cork came from humble beginnings in Kansas. He was born Clayton Linville Millner, but when he was a young boy his father dubbed him a ‘real corker.’ The name stuck and the rest is history…with a few twists and turns along the way, of course. After attending Kansas State University he joined the Naval Air Cadet program where he worked his way up to Lieutenant Commander. 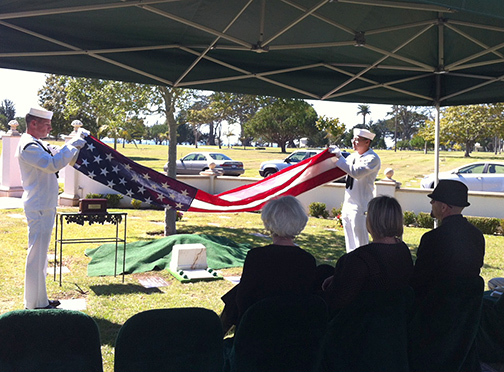 For twenty-two years he was known as “Corky,” a Navy pilot with some of the steadiest hands around. When he later launched his writing career and became a wine aficionado, he dropped the y and simply went by Cork, the perfect name for a self-proclaimed wine snob. Like many, I feel a tremendous loss with Cork’s passing, but I’m filled with gratitude for having had him in my life. Because of Cork Millner I am a professional writer, and now an author. 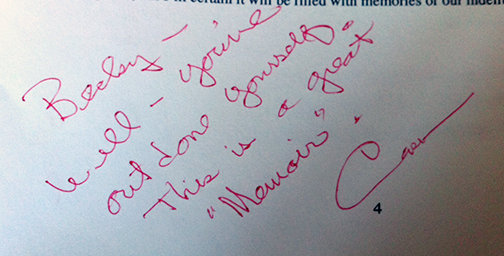 Cork believed in me and championed my work, even when I doubted it myself. If it hadn’t been for Cork’s red pen filled with love, support and generosity, I’d still just be dreaming about being a writer instead of actually becoming one. 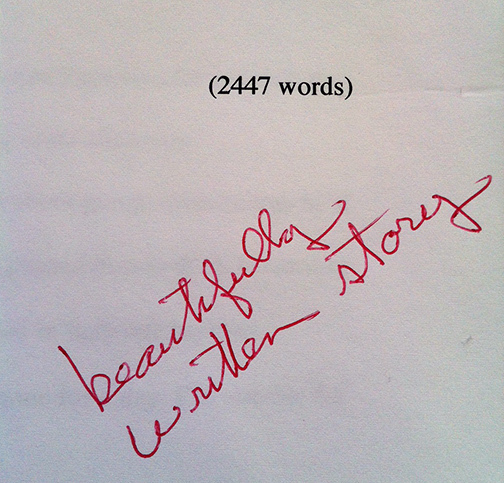 Feeling nostalgic earlier this morning, I poured through piles of manuscripts Cork edited for me over the past few years, smiling at the many comments he scrawled in the margins with his red pen. Sometimes it was just a word or two like “Clever lead” or “Powerful imagery.” Sometimes it was a full page. One of the most meaningful comments he ever wrote came to me when I was just starting out. It simply said, “You write in pictures,” which forever changed the way I thought about my writing. I feel compelled to share a few of his comments below so you can understand why so many writers credit him for launching their careers and why he has been coined, ”The Man Who Launched A Thousand Pens.” Not only did Cork have a gift for writing, but for mentoring and nurturing our creative, self-doubting, hypercritical writing souls. 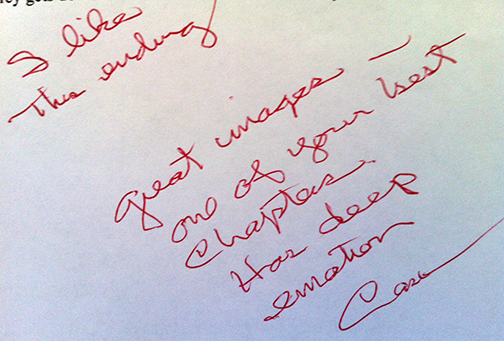 These are but a handful of the generous comments I came across while flipping through page after page of manuscripts. I am certain that every writer who ever took one of Cork’s classes or workshops received similar words of encouragement. Hundreds and hundreds, if not thousands, of writers were inspired by Cork and the words he wrote in the margins of their manuscripts. 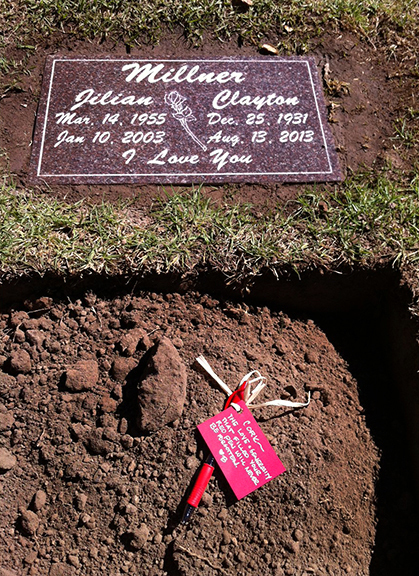 I placed a special red pen in his memorial plot in the Sunrise Urn Garden. Two fellow writers, Kaye and Nancy, felt similarly moved and added small cards with covers of their recently published books, thanking him for his support in becoming authors. 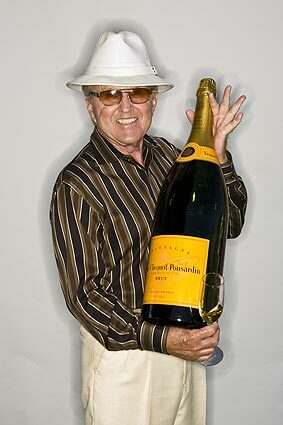 Afterward, a group of us writers hugged, cried, laughed, took pictures, then joined his family for a wake at his beloved polo fields in Carpinteria, where we all popped the cork for Cork. 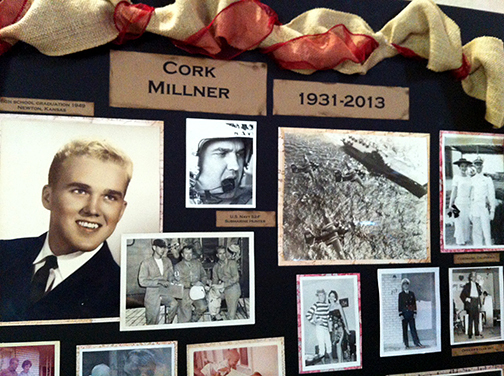 Here’s to you Cork Millner, for making a profound difference in all of our lives. PS: If you want to know what improbable moment brought Cork into my life in the first place, you can click HERE to read I post I wrote last year. 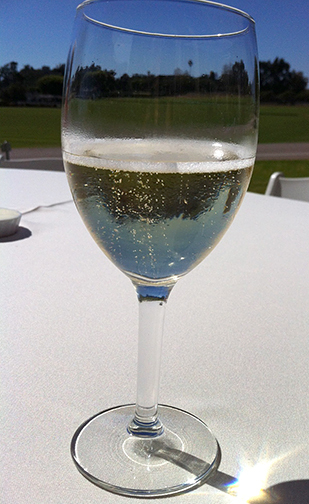 This entry was posted in Gratitude, Writing and tagged champagne, Clayton Millner, Cork Millner, Gratitude, memorial, mentors, obituary, santa barbara writers, tribute, writing instructor by Becky Green Aaronson. Bookmark the permalink. What a beautifully written tribute to our dear writing teacher, Cork. Thank you for capturing the day – It felt like I was there (I could not make it since I now live in Wyoming)- and reminding me of Cork and all his quirky ways and constant support to encourage the writer out of each of us, even me who had hardly written anything before I met him, and am now published. Santa Barbara’s writers will feel his loss deeply. Lori, I have thought of you so many times since you ventured off to Wyoming! Although I’ve fallen off the face of the earth trying to keep up with everyone’s blogs, I hope you are well and enjoying your new environs. I’m glad you appreciated this tribute to Cork. He made such a difference for so many people, he will certainly be missed. One thing I neglected to mention in my piece is the magic his class had in bringing us all together. I made so many great friends through Cork–many of whom I still see or stay connected with today. Lucky us for being part of something so special. Thank you for what you’ve written about my dad. I learned a lot I didn’t know. It wasn’t until his memorial service that I realized how many writer’s he had touched and taught. Most touching and inspiring to me though, was how deeply people felt about dad. I remember back as far as 30 years ago how dad would sit under a lamp in the evenings, before and after dinner, reading and commenting in the margins of his student’s work. I never really thought about how many years he did that. I’m a Kinder/1st grade teacher and we have a bulletin board titled “I Am a Writer,” where I hang the kids work. Interestingly, I was recently told that we teachers shouldn’t use red pens on kid’s papers, it might affect their self esteem negatively. Instead we should use blue! Funny, huh? Anyway, thanks so much for the insight I would have never had without your article. I’m so glad it will be published in The Independent. Kim, I’m so glad to have met you at your dad’s memorial. He was so proud of you and your brother and always beamed when he talked about you. Every class he would share your barrel riding piece and joke about how he kept your fee when it was published. He had such a funny sense of humor. I’m glad that we writers could help round out the picture you have of your dad, and bring back memories of how much he invested in his students. I always wondered how he chiseled out time to write with all the time he spent teaching and editing. I guess there’s always a way if you’re a hard worker like he was. I’m simultaneously amused and horrified that teachers aren’t allowed to use red pens anymore because it might hurt children’s self esteem. Good god, how absurd has our culture become?! 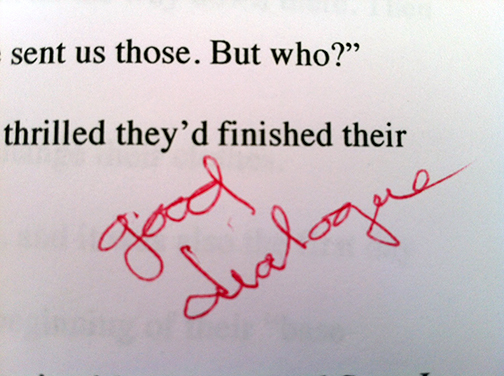 Maybe you should pass along my blog post to your school’s “higher ups” and show just how empowering a red pen can be for students! If you are anything like your dad, I’m sure you are a fantastic teacher, whether you use a red pen or blue! Thanks for swinging by my blog to share your comments. At some point, I’d like to send you an email with a couple more details about your dad, which I think you might enjoy. His memorial last week was perfect, as his friends, family and writing students gathered to pay our respects in a beautiful chapel (that Cork chose himself), followed by a military burial with Taps playing, and a lovely wake with lunch and fine wine – all on a beautiful sunny day! A few of us writing students made a toast to Cork for all imparted to us. Cheers to you, Professor Cork! Cheers to Professor Cork, indeed! I know Cork made a huge difference in your life, just like he did mine. We have much to celebrate, having had him share his wisdom and passion for writing with us. I think because he was wry and understated (not a gusher at all), his comments had even more impact on us. I’m glad we both let him know how much he was appreciated WHILE he was still with us, as I’m sure many others did as well. Wouldn’t it be fun to know how many times his name is mentioned in Acknowledgment pages? I’m sure it would be hundreds and hundreds. Thanks for swinging by to leave your comment and share your memories of Cork, Kaye! Cork was an unexpected friend. I have tried to figure out when we met but I can only narrow it down to polo at some point. Cork was a generous, kind, gentleman. He always had a seat for me in his box at the club. I talked him in to opening his home for a party when Prince William played. Cork was definitely a gentleman with a big heart. It doesn’t surprise me that he opened his home for a party when Prince William played. Thanks for sharing your fond memories, Heather. Becky, I didn’t know Cork, but through your words, you’ve brought him to life really well. I can see he was truly a special man. We could all use a mentor like Cork. How lucky you were to have him in your life! I feel lucky, indeed! 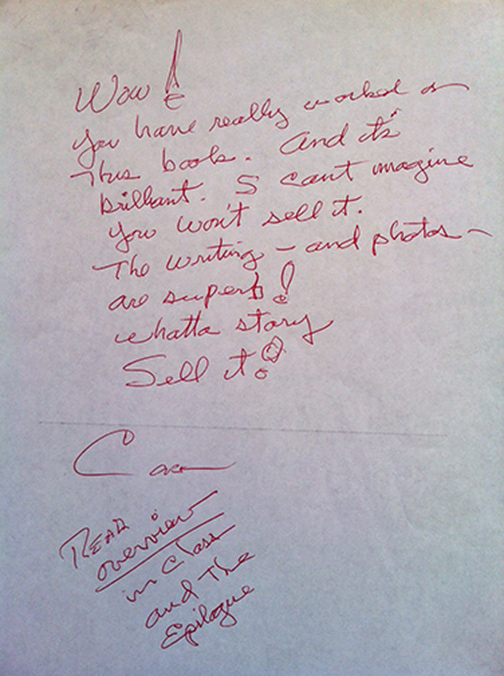 So do many other writers who were touched by Cork’s magic during his 30+ years of teaching. I’m glad you were able to appreciate the difference he made in all our lives. You have created a wonderful piece in memory of Cork. I have forwarded it to his family. The extremely fine writer that you are always pleased Cork. He spoke of your work often, with respect, and eventual reverence, for your capabilities and courage. It was rare to see him inspired to that level. It was always a delight to talk with Cork after his first couple of weeks in a new class. He’d say, “I have some very good writers in my class this time! I’m looking forward to what they’re going to produce. I even have a man who’s good. It’s always mostly women you know, and some of them are quite attractive!” But for him, over the years as more advance writers became his students, he was greatly encouraged about writing itself. I reminded him that more and more people were capable of writing because for so long he was a stand, a space for that, and made substantial contribution to the overall mindset of all writers. Little did he know that his influence spanned across those who never met him. That’s the magic of evolution. Much of the time it’s invisible and unnoticed until a “new era” emerges, which was not so much a leap, but the standing on the shoulders of teachers such as Cork. Miriam, I’m deeply touched by your comments. They not only make my heart sing with gratitude, but they reignite the fire in my belly to finally complete my complicated book in progress. I’m sure you won’t be surprised to know whose name will appear in my Author’s Acknowledgment page. And you are so right about Cork making a substantial contribution to the overall mindset of writers. He was a gem who will be missed by many–especially me. WOW, you captured Cork’s essence so beautifully! He was all that to me as well, but you put it so vividly. You painted a picture of what was Cork! I wish I could have been able to go to the Wake, but do have wonderful memories of his service, graveside service and the loving hugs we all shared as we remembered an amazing man. I am encouraged to begin writing again, it hasn’t been easy since his passing. I have felt lost, like a boat without a rudder, no one to guide me, but he taught me all I need to know and I must forge ahead on my own now. I know his spirit will be urging me on, not to quit. God rest his dear, dear soul. Ann, you are a wildly talented writer, as Cork pointed out so many times. The greatest tribute you could pay him is to keep on writing. I know that’s easier said than done, but you have such a special gift, I know you will find you voice again. I’m glad we were able to come together once again at his memorial to celebrate the special man who inspired all of us so much! We were all given something special “Write From the Start.” He is missed. Indeed, we were! And the best part is that I think we all knew and appreciated how lucky we were WHILE we were part of it, instead of realizing it years later. Becky, what a lovely tribute to a dear man. 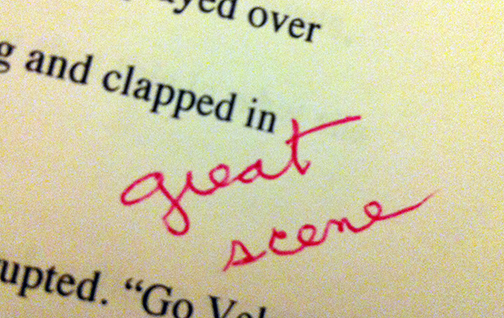 I also thank Cork for all of his encouragement with my writing. 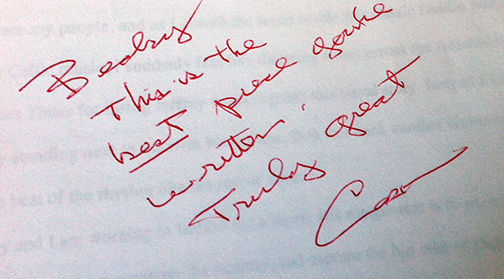 I’ve also saved those pages with Cork’s comments written in that loopy handwriting in red pen. He was a jewel. Thank you for writing this about our beloved mentor. May he rest in peace. I know we have talked often about the magic of Cork’s class, and how the environment he created helped build bonds that will last a lifetime. We are extremely lucky to have been part of it!